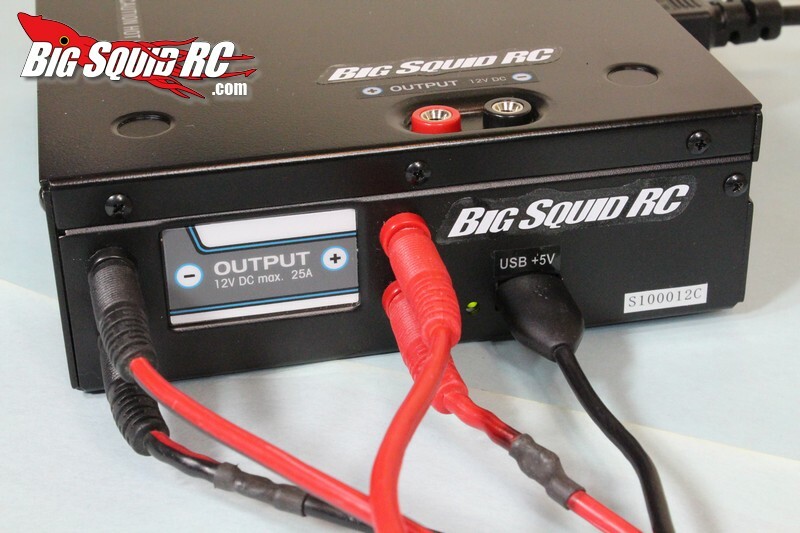 Review- TrakPower DPS 12V 25 Amp Power Supply « Big Squid RC – RC Car and Truck News, Reviews, Videos, and More! If you are into the rc hobby to stay there are a few items that you use all the time where spending the extra money on a high end item is worth it. For example, a good transmitter will last for years and be worth every extra penny. 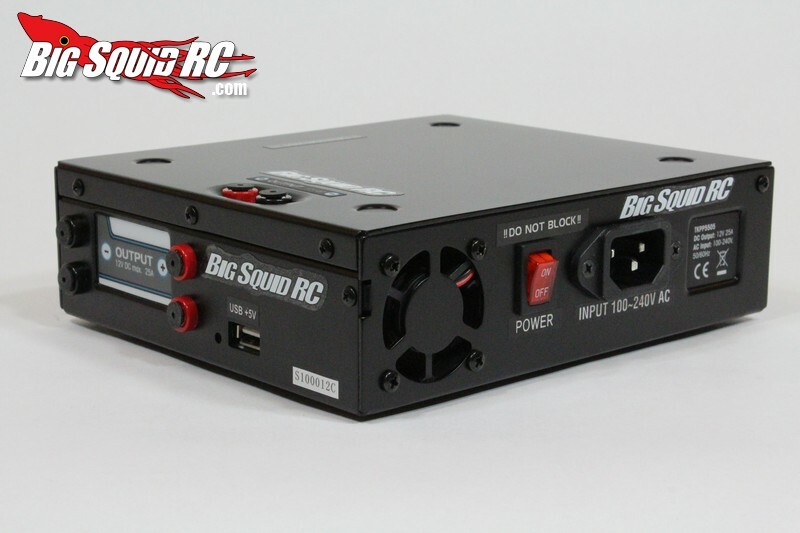 On that same note, if you are a serious hobbyist you need a good 12 volt power supply. A good power supply is well worth the extra cash as the years pass by. 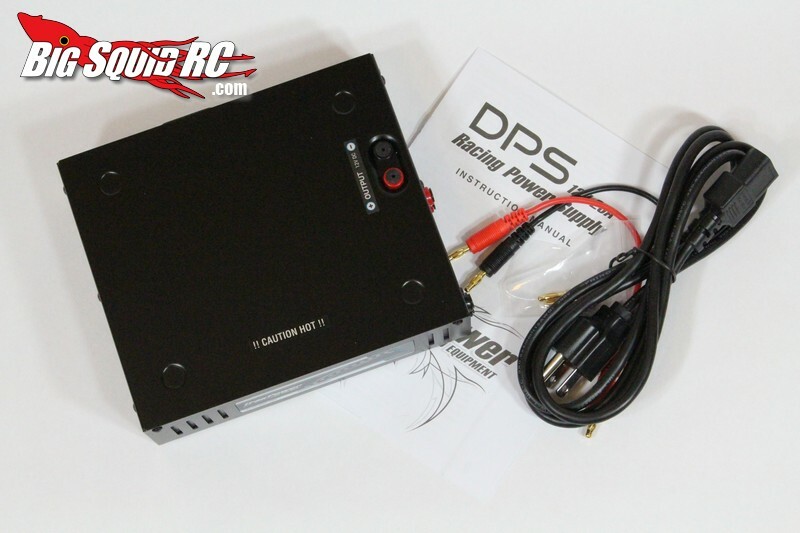 When TrakPower introduced their new VR-1 Battery Charger they also introduced a mating power supply called the DPS 12v 25 amp. When we reviewed the VR-1 the DPS worked as a perfect mate for it, since then we’ve been running the tar out of it on a variety of other battery chargers to see how it stacks up. Let’s get on to the review shall we? 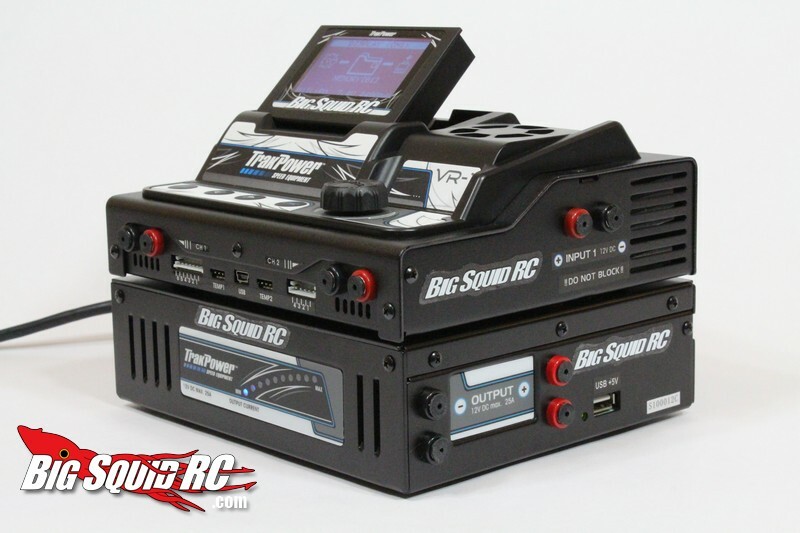 Primary Competition: Venom PS350, Hitec ePowerBox 30, LRP Competition 20 amp, and multiple others. What’s In The Box: Power supply, power cord, manual and wire with banana plugs. Build Quality: Solid metal case, large, nicely done on/off switch, very nice all around. Set-up Notes: While we primarily used the DPS with the TrakPower VR-1 battery charger, we also used it with a Radient Origin, a pair of Hyperion 720iNet3’s and a pair of Duratrax ICE’s. Ease of Use: Super easy, plug the DPS into a wall outlet then plug in your battery charger (or chargers) via 4mm banana plugs. 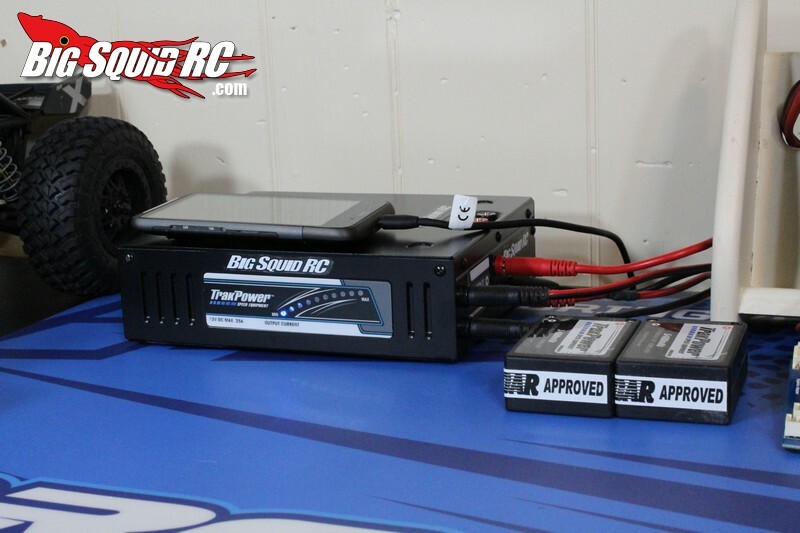 The DPS also easily mounts right below the TrakPower VR-1 Race Charger. Power: The DPS is rated for 25 amps maximum, but we pushed it much farther than that on multiple occasions. If you are planning on using the DPS only with the TrakPower VR-1 you are dialed, it has more than enough yank. The 25 amps the DPS provides is more than enough for most applications, but if you do a lot of very high current or high cell count charging the DPS might not have enough power for those applications. Broken Parts/Issues: The DPS got our usual drop test from our pit table, about a 27″ drop, to concrete with no issues afterwards. Ok, it did have a slight dent on the corner, but worked to perfection. We also stress tested the DPS by putting a pair of Hyperion chargers on it, each charging a 2S Lipo at 15 amps (about a 252 watt load). The DPS handled the pair of Hyperions at 15 amp each with no issue. We measured a maximum case temp of 95 degrees Fahrenheit (67 ambient) and the lowest we saw the voltage drop was 11.7. 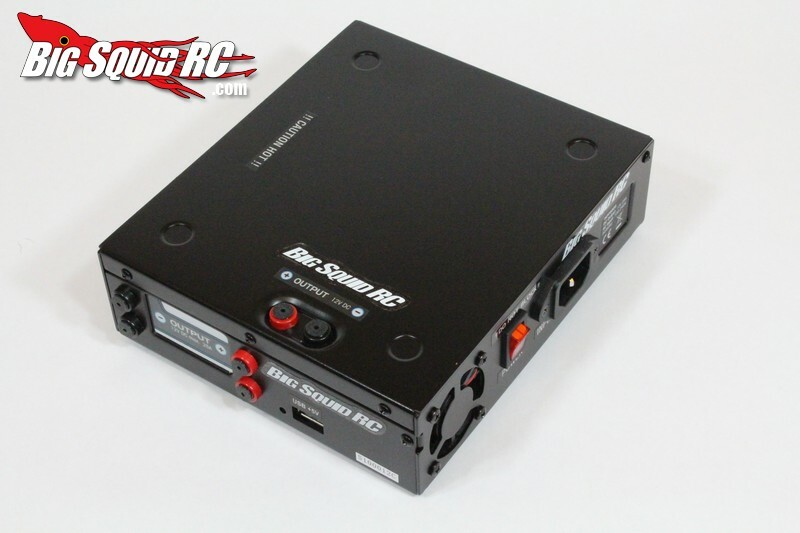 Very impressive, rock solid power supply. We’ve seen other “25 amp” power supplies shut down (even burn up) on that load. The UBS port comes in amazingly handy, we used it on a bunch of different electronics. The output lights are neat and function properly. The DPS looks very trick, definitely not a run of the mill power supply. The DPS has 3 pairs of outputs, which is much nicer than most power supplies that have just one or two. The way the TrakPower VR-1 charger mates to the DPS is very sano. While the fan wasn’t the loudest we’ve heard (far from it), it wasn’t the quietest either. If we could make one improvement on the DPS it would be a quieter fan. Time To Bash: A It doesn’t get any faster than this, plug it into the wall, plug your charger in, flip the switch and you are dialed. 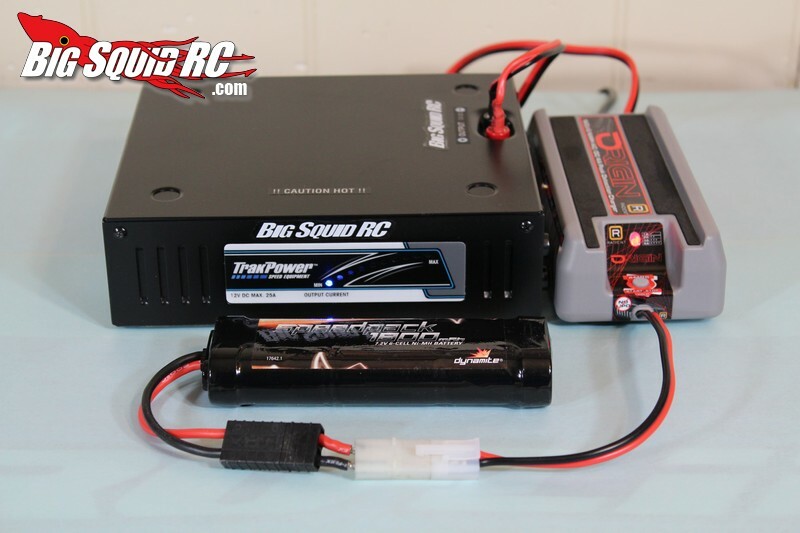 It takes about a minute to hook it up, that’s pretty fast for anything in the rc world. 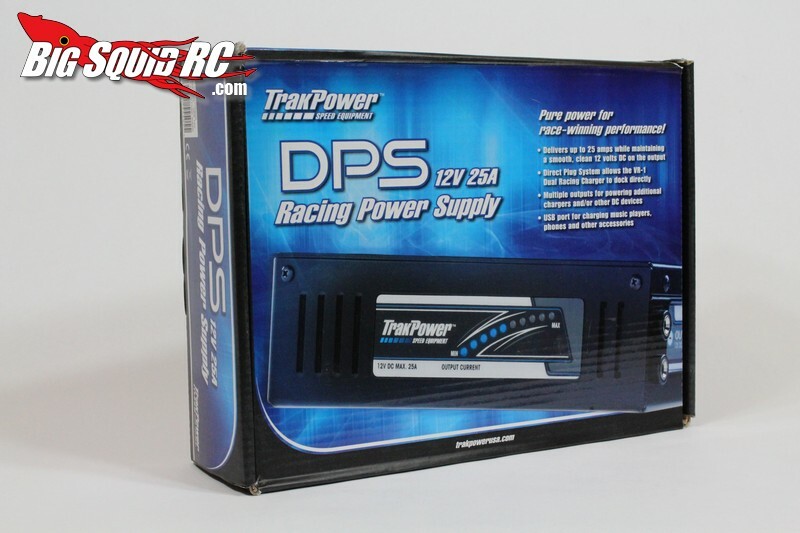 Car Show Rating: A The TrakPower DPS has the distinction of being the best looking power supply on the market. From it’s black “murdered out” paint to its variable output lights, it’s very trick. Bash-A-Bility: A We dropped it off a pit table to concrete and rocked it with a pair of chargers at 15 amps with absolutely no issues afterwards. 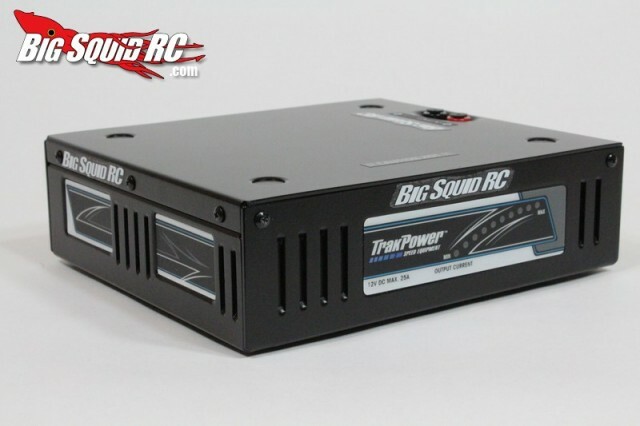 Power: B At 25 amps the DPS is no lightweight, but there are units on the market with more raw power. Value: B It looks great, it has three pairs of 4mm bullet outputs, it has output lights, and it has a very handy USB output, all for about $100. When looking around at its competition the DPS typically has more features and/or more power, thus making it a good value in our eyes. Big Squid Rating: A- Good power, great features, and very trick looking, if you want the best 25 amp power supply on the market the TrakPower DPS is it.